Edición en notación moderna de su obra original en tablatura para guitarra barroca, publica por su autor en 1732 (english & spanish text). POPULAR DANCES is a registered title By Soneto. This volume II belongs to the book: "Resume of accompain the part with the guitar 1714". 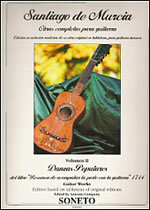 This volume contains a plenty collection of dances and contradances, with certain French influence that however, performed according to the strumming technique give them an unmistakable Spanish air. The charm of this piece lies in the simplicity of the writing, comprehensible to technical middle level guitar's students, since more of them are developed into the first five frets and many easily performable chords. Starting from the half of the book the difficulty degree of pieces increases gradually just to arrive to the last part where the most worked and artistic ones are and, like S.de Murcia suggest a the prologue, "they are addressed to the more advanced"